As we embark on another school year, I thought I would launch a new series, Makerspaces A to Z. Throughout the year I’m going to share what I think are the key ingredients to building a sustainable makerspace in a series of short blog posts. We'll kick off the series with Aspirational. I do believe in the importance of creating makerspaces that are Inspirational (In fact, that is one of my attributes of a GREAT makerspace) however, in the age of platforms such as Pinterest and Instagram, I do believe we are beginning to suffer from inspiration fatigue. 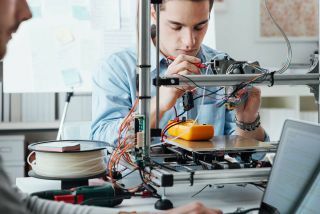 While yes, we do want our makerspaces to feel inspirational, it feels rather shortsighted in that focusing on inspiration alone, might possibly only temporarily stimulate our students to do something or feel something. Aspiration, on the other hand, is more long lasting and meaningful. It involves understanding where you want your students to go next, or where they themselves want to go, and figuring out how your makerspace can get them there. Think through the expansive possibilties of your makerspace and future iterations of your makerspace. You might not be able to accomplish these things now, but it will allow you to see what is beyond. This is easier said than done, but doing so, will ensure that your makerspace is sustainable and will set your space apart from others that are focused on the next flashy piece of technology or spaces that are only visually appealing. I would love to know what you think makes a makerspace aspirational! Share your thoughts with us at #MakerspacesAtoZ!